Thanks Brad. I also tached the HQ5030 prop in the setup shown below and found the TD049 R/C spinning it at 21.5k i.e. a massive 3k more than the COX black 5x4...I know the pitch is less but I did not expect such a development. Maybe apart from the 1inch less pitch the thinner airfoil and less prop weight both helped this static speed rise? Great vid Brad ...just asking, do you strengthen the lead edge of the Nano III wing with a layer of CA glue or anything just in case you hit a strong weed when landing? You mentioned I should think of the engine thrust a bit. 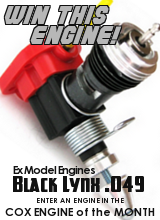 Do you have any offsetting angle on the engine shaft relative to the CL of the Nano III fuse? I did not set anything hoping the genuine design of the VooDoo will have incorporated whatever was needed. Plus, the silicone exhaust extender with its face area and weight both is expected to drag the plane a bit to the right no matter if there is no thrust offsetting angle...what do you think? I would not place an escape chamber, I would leave it free and scream !! 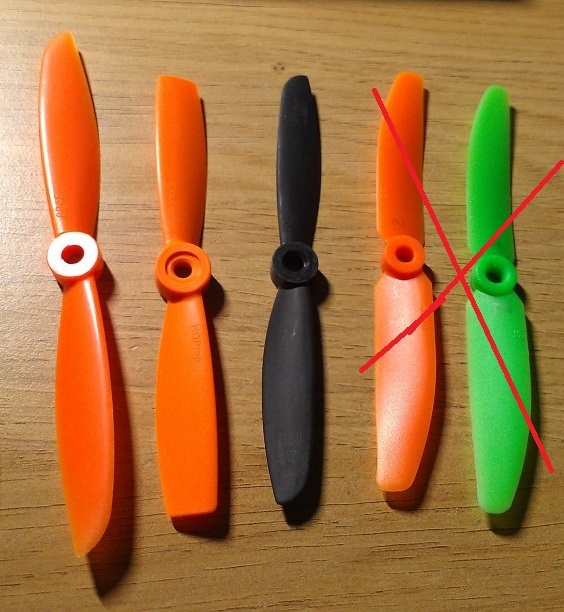 Do not recommend that prop it is no good for IC use. That blade type is not as good nor safe to use. with more beef connecting to the prop hub. The type with the speed tips is best. Yes I have right engine thrust always on all projects. CL planes typically have more offset. Combat CL have a great amount of offset they are fast typically with no vertical stab. some right thrust. You need 3 degrees for RC use. they put out more rpm and strength. The leading edge has a natural two layers of monokote for protection. thank you. I will probably abandon the exhasut muffler and the extension after I have made sure the hot castor and the nitro will really not have any impact on the coating of the plane. Brad, thank you for the advice. Here are some alternate props I could see used on the Voodoo.. Without modifications which one do you think would be the optimum? 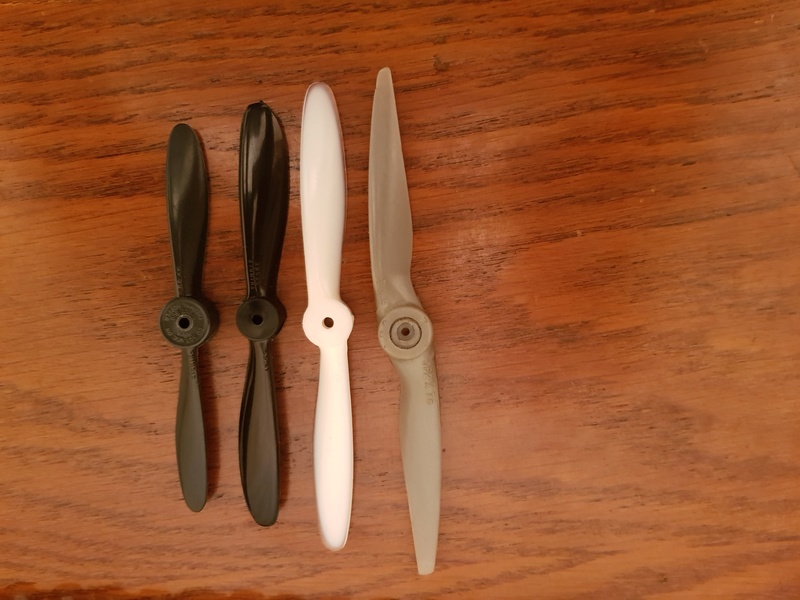 4.5x4 when it comes to Cox props. 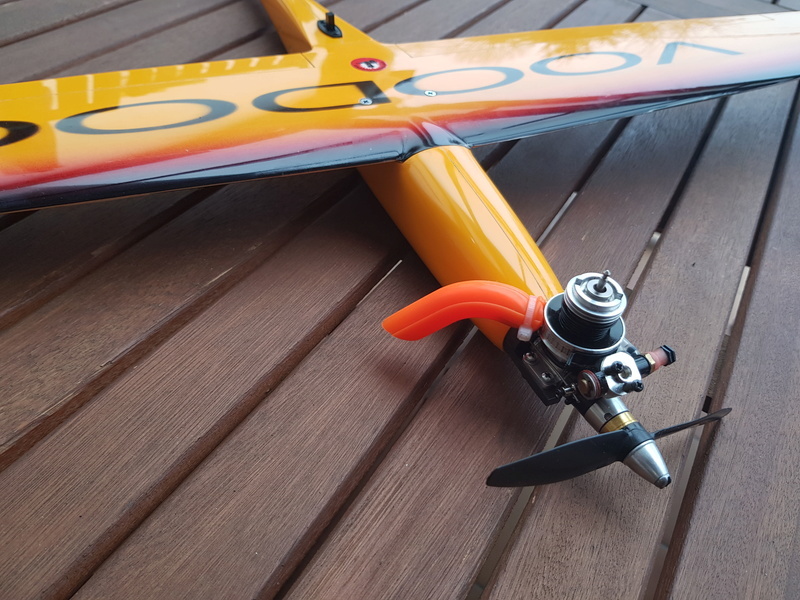 Despite the cold weather here I could not resist any longer to maiden the VooDoo..My concerns were whether the engine mount was missing the offsetting a few degrees to the right to balance the gyro effect, and, finding the proper prop size. The plane flew beautifully, meaning it does not need any engine mount offsetting, it flies as straight as any well balanced plane would do. By the time of this recognition I was virtually shivering from the cold wind at the field, and decided not to continue the maiden exercise with the next, better prop, but made it for home. Next time I will use the COX 5x4 and 4,5x 4 props as Brad advised, and also the APC 4,7x 4,25 I recently bought. Real IC engine props not some electric quadcopter trash, these COX props will hopefully generate the thrust the VooDoo needs. Lol not trash just the wrong drone prop is all, no airfoil on that flat plate type. flies with a quality carbon / blend HQ drone prop at 148 mph with a .05 engine. Far from trash. HQ carbon blend speed tip 4045 amazing results at 36k rpm. I am happy to know it has flown congratulations!!!!! Little country, big city. Second largest in Europe I believe. I have always been fascinated by Budapest, divided in two by the Danube. Buda on one side and Pest on the other. Beautiful city with a colorful history. Thanks, Bob..with 2 million inhabitants Budapest the capital is not a small city but is certainly smaller than many in the rest of Europe, like Paris, London, Rome, etc...Have you ever visited here? flying without needing any right aileron trim. balogh wrote: Thanks, Bob..with 2 million inhabitants Budapest the capital is not a small city but is certainly smaller than many in the rest of Europe, like Paris, London, Rome, etc...Have you ever visited here? Bucket list. My son retires this year and I would like to take one of those excursion cruises up the Danube. He has been all over Europe in the past and knows Germany and the rail systems. Bob once in or near Budapest you should let me know and I will make sure you and yours will have some good time here...not just obligatory courtesy on my side, please take it seriously. balogh wrote: Bob once in or near Budapest you should let me know and I will make sure you and yours will have some good time here...not just obligatory courtesy on my side, please take it seriously. Thanks for the gracious invitation. I would love to see all the models you have posted about here over the years. My son loved Munich when he was there during Oktoberfest and skied in the Alps. Your just a short jaunt over from Vienna, another of my dream destinations. If I get there, you will be sure to see me. 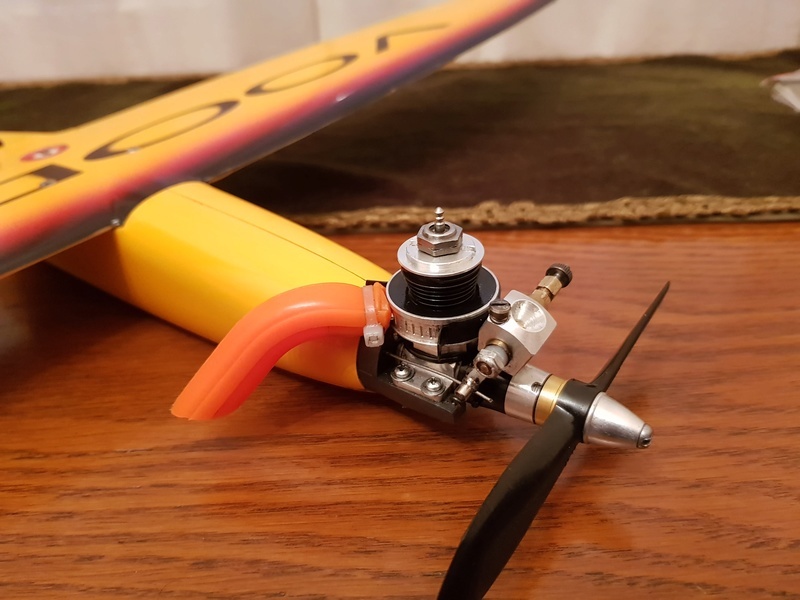 I added a Galbreath head with Nelson turbo plug and swapped the COX 050 RC carb with a Tarno just to arrive at more stable rpm in the air..the COX RC gear did not work out well and I lost the idlescrew mid-air...too bad I like genuine COX stuff on my planes but you cannot have always what you want..the exhaust header helps keep the bird a bit less snotty in castor and given its 10mm bore it does not restrict the engine in addition to what the muffler already robs in rpm. 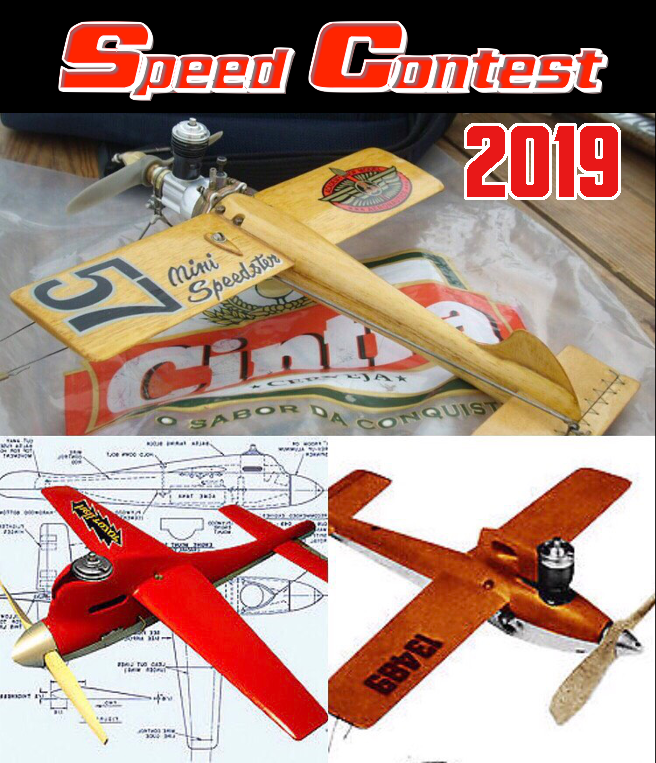 Man this is a super fast plane at least probably the fastest I have ever flown including the Lil Roughneck that is some 3oz lighter. We will have a long weekend next week with plenty of sunshine forecast and I just need to figure out why my Sony headcam is on strike before I make some vids. Good to hear you where able to test fly it again. Did your carb stop barrel have a spring on the set screw? another stop screw or tap it for a metric size perhaps 2mm. 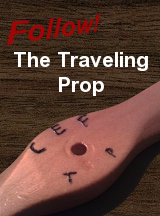 What sort of rpm did you get out of that prop? Yes I also prestress the springs but the thread in the aluminum carb body wears loose by vibration and after that even the prestressed spring does not help. 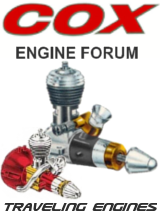 I have a few Cox RC carbs disfunctional for this reason. Maybe a bit larger metric screw self-tapping a new thread in the carb may help. The 5x4 prop static speed in this setup is 18.6k. It even makes a zing noise as it goes by moves on and is very stable congrats on the flight and getting some time outside!! Beautiful as that model András goes, congratulations! I see that it even has a lot of autonomy in planning, I like that plane!